Stand a chance to win up to N10 million and other awesome prizes in the Rio 2016 Olympics Telethon Raffle from Team Naija. Text RIO to 35818 to qualify for the daily and weekly draws. 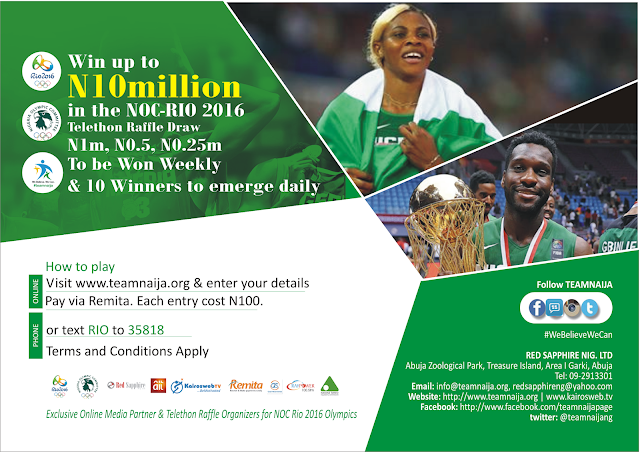 Or enter Online at entertherio2016telethonraffle.teamnaija.org and pay N100 via Remita platform. Each entry costs just One Hundred Naira!! The more you play, the more chances you have of winning. The phone numbers used for entry. 10 lucky entrants will emerge winners during the daily draw where a pick of ten phone numbers will be randomly drawn to win cash and other awesome prizes. All entries during the week are collated and on the last day of the week 3 lucky entrants will emerge the star winners of the week winning N1million, N500,000 and N250,000 respectively. When is the deadline?is it still on?